NCERT Solutions for Class 10 Math Chapter 15 Probability are provided here with simple step-by-step explanations. These solutions for Probability are extremely popular among class 10 students for Math Probability Solutions come handy for quickly completing your homework and preparing for exams. All questions and answers from the NCERT Book of class 10 Math Chapter 15 are provided here for you for free. You will also love the ad-free experience on Meritnation’s NCERT Solutions. All NCERT Solutions for class 10 Math are prepared by experts and are 100% accurate. (i) Probability of an event E + Probability of the event ‘not E’ = _______. (ii) The probability of an event that cannot happen is _________. Such as event is called _________. (iii) The probability of an event that is certain to happen is _________. Such as event is called ________. (iv) The sum of the probabilities of all the elementary events of an experiment is _________. (v) The probability of an event is greater than or equal to _______ and less than or equal to _______. (i) It is not an equally likely event, as it depends on various factors such as whether the car will start or not. And factors for both the conditions are not the same. (ii) It is not an equally likely event, as it depends on the player’s ability and there is no information given about that. When we toss a coin, the possible outcomes are only two, head or tail, which are equally likely outcomes. 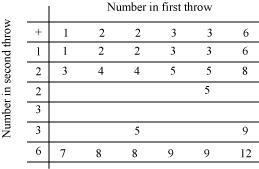 Therefore, the result of an individual toss is completely unpredictable. Probability of an event (E) is always greater than or equal to 0. Also, it is always less than or equal to one. This implies that the probability of an event cannot be negative or greater than 1. Therefore, out of these alternatives, −1.5 cannot be a probability of an event. Therefore, the probability of ‘not E’ is 0.95. (i) The bag contains lemon flavoured candies only. It does not contain any orange flavoured candies. This implies that every time, she will take out only lemon flavoured candies. Therefore, event that Malini will take out an orange flavoured candy is an impossible event. (ii)As the bag has lemon flavoured candies, Malini will take out only lemon flavoured candies. Therefore, event that Malini will take out a lemon flavoured candy is a sure event. Gopi buys a fish from a shop for his aquarium. The shopkeeper takes out one fish at random from a tank containing 5 male fish and 8 female fish (see the given figure). What is the probability that the fish taken out is a male fish? (iii) The numbers greater than 2 are 3, 4, 5, 6, 7, and 8. (iv) The numbers less than 9 are 1, 2, 3, 4, 6, 7, and 8. (i) Prime numbers on a dice are 2, 3, and 5. Five cards−−the ten, jack, queen, king and ace of diamonds, are well-shuffled with their face downwards. One card is then picked up at random. (ii) When the queen is drawn and put aside, the total number of remaining cards will be 4. (iii) a number divisible by 5. (ii) Perfect squares between 1 and 90 are 1, 4, 9, 16, 25, 36, 49, 64, and 81. Therefore, total number of perfect squares between 1 and 90 is 9. Suppose you drop a die at random on the rectangular region shown in the given figure. What is the probability that it will land inside the circle with diameter 1 m? (ii) A student argues that ‘there are 11 possible outcomes 2, 3, 4, 5, 6, 7, 8, 9, 10, 11 and 12. Therefore, each of them has a probability . Do you agree with this argument? (ii)Probability of each of these sums will not be as these sums are not equally likely. (i) If two coins are tossed simultaneously there are three possible outcomes−−two heads, two tails or one of each. Therefore, for each of these outcomes, the probability is . (ii) If a die is thrown, there are two possible outcomes−−an odd number or an even number. Therefore, the probability of getting an odd number is . When two coins are tossed, the possible outcomes are (H, H), (H, T), (T, H), and (T, T). It can be observed that there can be one of each in two possible ways − (H, T), (T, H). Therefore, the probability of getting two heads is , the probability of getting two tails is , and the probability of getting one of each is . It can be observed that for each outcome, the probability is not . When a dice is thrown, the possible outcomes are 1, 2, 3, 4, 5, and 6. Out of these, 1, 3, 5 are odd and 2, 4, 6 are even numbers. Therefore, the probability of getting an odd number is . There are a total of 5 days. Shyam can go to the shop in 5 ways and Ekta can go to the shop in 5 ways. (i) They can reach on the same day in 5 ways. (ii) They can reach on consecutive days in these 8 ways - (t, w), (w, th), (th, f), (f, s), (w, t), (th, w), (f, th), (s, f). A bag contains 5 red balls and some blue balls. If the probability of drawing a blue ball is double that of a red ball, determine the number of blue balls in the bag. Let the number of blue balls be x. However, the number of balls cannot be negative. A jar contains 24 marbles, some are green and others are blue. If a marble is drawn at random from the jar, the probability that it is green is . Find the number of blue balls in the jar. Let the total number of green marbles be x.